Ensure your nursing colleagues are not missing out on the association's latest membership offer. Now for only $100, RNs and NPs who are not RNAO members can join and enjoy all the benefits of being a member. For colleagues who work 15 hours or less per week, their membership fee is only $87.83. 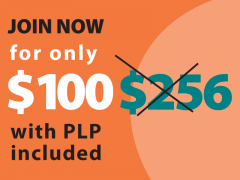 This includes professional liability protection (PLP), as mandated by the College of Nurses of Ontario (CNO), discounts for up to 40 per cent on institutes, conferences, workshops and professional development, RNAO's bimonthly publication the Registered Nurse Journal and our monthly newsletter In the Loop. Memberships are valid until Oct. 31, 2019. Urge your nursing colleagues to join RNAO at this special rate. Recruit five new members and receive free membership next year or receive a $20 RNAO gift certificate for each recruit. Be sure your recruits include your RNAO membership number on the online registration form.